Added a carrying bag, Original Jiusion microscope is better for kids, Students, Adults and aged generations to observe coins, circuit boards, stamps, skins, hairs, jewelry, insects and so on. 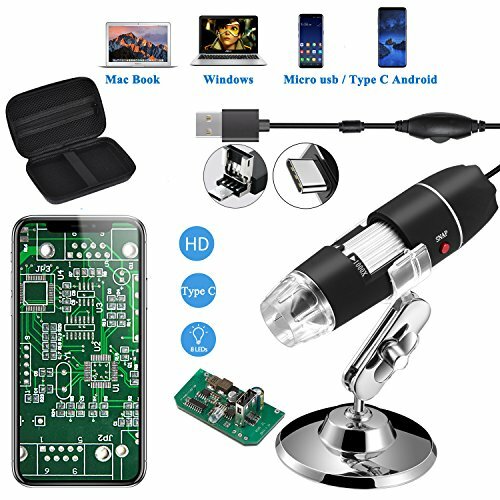 With type C/micro usb connector, you can use the microscope on OTG Android cellphone. The microscope also works on Mac, Windows, Linux and Chrome. Note this microscope doesn't work on iPhone or iPad unless you buy a Jiusion Brand wifi box. Built-in 8pcs LED lights, digital microscope's 2 adjusting knob can change the focus and brightness. With this usb handheld magnification, you can use the software to record the micro world, capture screenshot and record video even in the wood without data services. On Window computer, you can use the software's measurement function to measure the least bit.